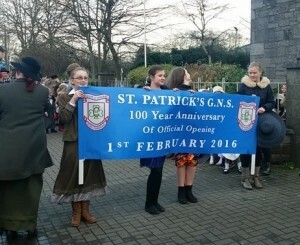 On the 1st February 2016 students from St Patrick’s Boys and St Patrick’s Girls national schools replaced their uniforms with costumes from 1916 as part of the celebrations. 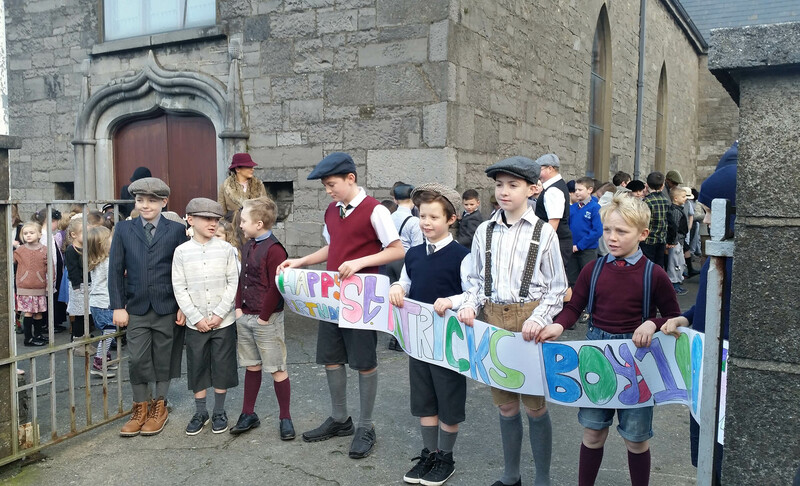 Pupils and staff from both schools re-enacted a walk which was made by pupils of the old St. Patrick’s Boys’ and Girls’ school from the church on Clare Street to the purpose built school on the Dublin Road. The first school in the parish was in a room at the back of the church, then came a joint boys and girls school in 1916 (the first stone was laid in 1915, the school was erected by local funds and built with local labour). Finally in 1966 due to expanding numbers in the parish the boys walked again, this time across the road to their new school, while the girls remained in the older school. Below is a video from the very windy morning of the children and teachers leaving St Patrick’s Church on their way to St Patrick’s schools. Margaret Mayburns, the grandaunt of Sinead Clancy a teacher in the the Girl’s School, was one of the students who made the same walk one hundred years ago. Later that same day both schools received their Irish Flag as part of the National Easter 1916 Commemorations. 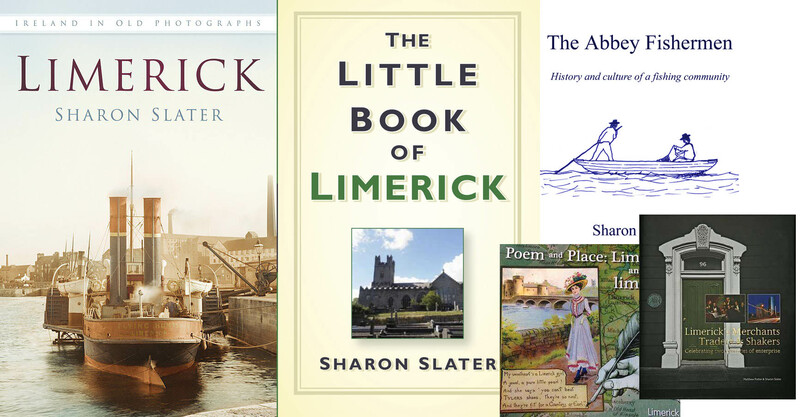 Hi Deirdre, Have you tried contacting the Limerick Leader, they hold the largest collection of images of social events from that period. I thought it would be easy to find out if any photos existed of people at a dinner dance in Limerick in 1959. It was attended by workers from Sloan’s drapery shops. Sloan’s had branches around Ireland and my husband worked in the Galway one. I think I’ve reached a dead end.